Did you buy a fake art work from Bansky at Central Park? Home Visual Arts Did you buy a fake art work from Bansky at Central Park? 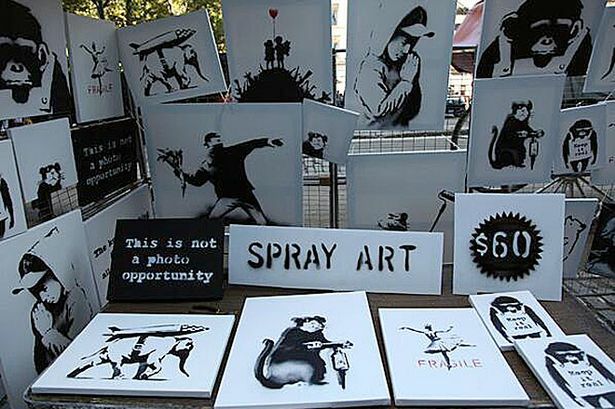 Banksy set up a stall yesterday by Central Park and tried to get you to buy priceless work for next to nothing. But why didn’t you? Is this Banksy? Picture taken might finally be him (at last). Banksy yesterday tried to pull off the improbable. He tried to sell you legitimate work that actually belonged to him under the guise that it was actually fake leading to the idea what is the real value of art in the first place? Especially when a name brand player tries to pass it off as a fake and there are scant takers whilst the name, Banksy in general commands premium. Except when Banksy pulls off a fast one and tries to sell himself off as a fake. Which of course makes the whole idea of what art is in the first place that more questionable and by proxy Bansky’s art even more wildly more valuable, assuming you can tell that it’s real, assuming that stuff even matters. It all came about when Bansky under an alias went on to set up a fake stall offering three dozen Banksy’s worth a collective million for $60 each. But by the end of the experiment, only three people had purchased pieces — including a woman who asked the vendor to knock the price down by half. The lucky few who did accidentally pick up a few authentic Banksys for their “kids” or their “walls” are now the owners of work worth well into the thousands. Banksy has since insisted the stunt was a “one-off” and the stall will not be there again, yet one wonders what else Bansky has in stall as he continues to throw us all for a loop during his one month sojourn in NYC. Grand profit on the day? $420…. But does your average person buy Diamond for drilling, or gold as a conductor? of course not. I think what Mick was trying to get across is that, we put unnecessary value on objects that are effectively useless TO US. If we did not use Gold or Diamond as jewellery, but only for what it’s properties befit, do you think they would cost so much? The only reason they cost so much is because us (the consumer) are willing to pay so much for something that we can happily live without. Exactly. It’s ‘The Emperor’s New Clothes’ syndrome. Idiots buy into the hype of his name, and pay hundreds of thousands of dollars for what is just ordinary art. And the moment somebody points out that there’s nothing special about the art, the rabid sheeple attack him because he exposes their foolishness. This is why fraudsters and charlatans like Damien Hirst can sell stuffed sheep for millions of dollars- people want to be ‘in’ on the latest artwork. Sheep. Modern art is the biggest fraud of our time, and mindless zombies fall for it. Bansky is a good artist. I personally like him, and his mysterious, subversive persona. But that’s the point- there are thousands of students in arts schools around the world who are as good or better artists than he is. However, he has marketed himself excellently and created a brand with publicity stunts like this. And the gullible public laps it up. Who says marketing doesn’t work? I will continue to observe and enjoy the spectacle of sheeple led by the nose into paying millions for ordinary art because of the name of the artist. In fact if this stunt proved one thing, it is that without the name recognition, most of these celebrated artists LITERALLY couldn’t sell their work for $60 on its own merit!